How many times have you had an idea that you were really passionate about? ​One that you really believed was important? How many times have you waited until you had the perfect amount of time or the perfect environment or the perfect set of circumstances to act on that idea? How many times have your ideas vanished into thin air because those "perfect" opportunities never came? We've been on a two-decade quest to find better ways to take action on our ideas-and share those strategies with others. In this book, you'll learn exactly how to harness the power of now to take action on your ideas. You'll learn how to alleviate anxiety, face your fears, and overcome overwhelm-all so you can bring your ideas to life. Our rigorously tested Action Surge Blueprint incorporates elements of instructional design, social science, and adult learning theories. It's helped thousands of people just like you create a bias toward action to enhance their relationships, start new companies, earn millions of dollars, and improve their health-and ultimately lead the lives they dreamt about. We just launched the book and have already reached Amazon Best Seller status. You can purchase the book in hardcover, softcover, Kindle, and audiobook formats now on Amazon. "In order to take action and have real impact we must be willing to take risks and fail. We need to educate our children to be comfortable with risk and failure to breed a culture that can change the world for the better and tackle the world's grand challenges. Ideas are easy. Action is hard. 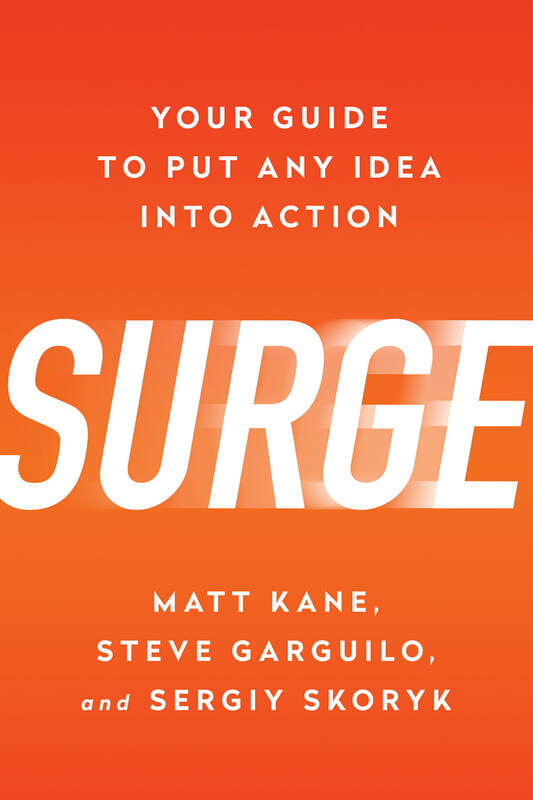 Surge is a great read. It teaches one how to take steps towards actually making a difference." "If you're even contemplating whether or not you have a strong ability to take action, if you have any questions or doubts about your ability to do something, you need this book more than you know." "I can say with 100% confidence this book helped speed up the process to create my new business." "These guys are the scientists of action. I've always had too many ideas to execute, but this book has provided me with the tools to confidently take those difficult steps into the unknown."